← Week 1 – We’re back in business! Week 2 – Bring on the subs..
Winter hasn’t been as bad as it could have been weather wise, although if you’ve been caught in the floods or the gales of late you could be forgiven for thinking otherwise. Last week our consumer team took a look the issue of flooding, with Fiona Foster and legal eagle Kevin Poulter offering advice to those who have had the misfortune to suffer from flooding and then discover that their insurance hasn’t covered them. One top tip, is that if you receive a warning of flooding on your phone from the environment agency – and you hit the button as requested to indicate that you have received the warning – you are usually required by your insurance policy to take preventative steps against flooding. This means moving things upstairs, protecting your thresholds with sandbags etc. Hopefully you won’t be in a position to have to do this, but at least now you know. One of our guests sadly didn’t make the studio last week, actor Tim Healy was unwell but fellow Benidorm cast member Jake Caruso stepped boldy into the breach and came on the show at the last minute. 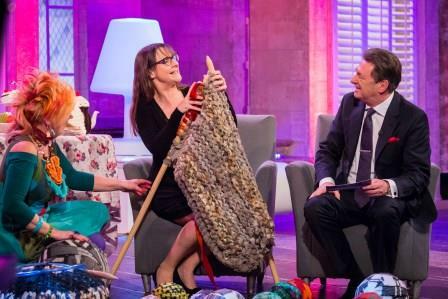 We had many contributors, including the extreme knitting ladies who brought in record breaking needles and got actress Pauline McLynn in a rare old tangle. This week sees Christopher Timothy and Mat Horne on Monday, Tuesday brings Martin Shaw and Les Dennis, Wednesday welcomes Neil Dugdeon and Zoe Lucker, Thursday’s child is Ben Fogle, along with Jenny Seagrove and we have Friday with Fiona Bruce. All in all, another cracking week here in Studio 2 – I hope you’ll be watching and you join in all our regular fun on Facebook and Twitter.